The museum has replaced its DVD players with solid state playback units. We have 4 separate coaxial cable distribution networks, one each for British prewar sets, American prewar sets, American postwar sets and Color sets. The solid state players (made by Micca) allow us to program each area with different materials. Programming material is on thumb drives. Baird Televisor: Our Baird televisor is driven by the audio output of one of the Micca players. Some time ago we wrote a program to convert a short NTSC clip to the 30 line Baird standard and save it as a MP3 file. Using an audio editing program we duplicated the 15 second segment many times until we created a file that is about an hour long. The Micca player is programmed to play and repeat the file. The right channel contains the video information, while the left channel contains the sync. A 40 watt PA amplifier is used to drive the Televisor phonic coils (through a step-up transformer) and a vaccum tube amplifier drives the neon. Western Empire State: A Micca player plays and repeats a MP4 file (now a Mickey Mouse cartoon, since they contain material that is easier to see on a mechanical set). The video is fed to a custom made Aurora converter that produces a 45 line triple interlaced video signal, which is the fed to the Empire State. British Prewar: A Micca player drives an Aurora 405 line converter, which in turn is connected to a homebuilt 405 line modulator, then to an RF amplifier and splitters to feed each outlet in the British Prewar rooms. American Prewar: A Micca player drives a standard channel 3 NTSC modulator, which feeds an RF amplifier and splitters to feed each outlet in the American Prewar room. NTSC works fine on the prewar sets, even though they were designed for use on 441 lines. 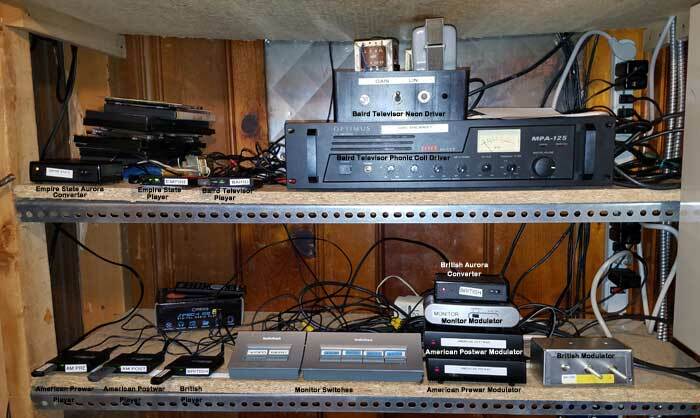 American Postwar: A Micca player drives a standard channel 3 NTSC modulator, which feeds an RF amplifier and splitters to feed each outlet in the American Postwar rooms. 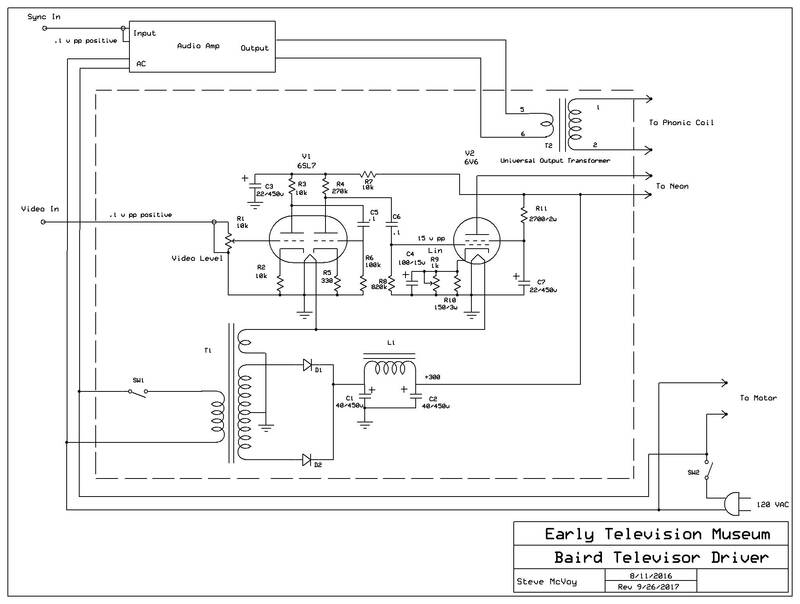 Monitor: The video signals from the Micca players for the Empire State, British Prewar, American Prewar and American Postwar are also fed into a video switch, the output of which feeds a standard channel 4 NTSC modulator, which is connected to a TV set to monitor the video signals. 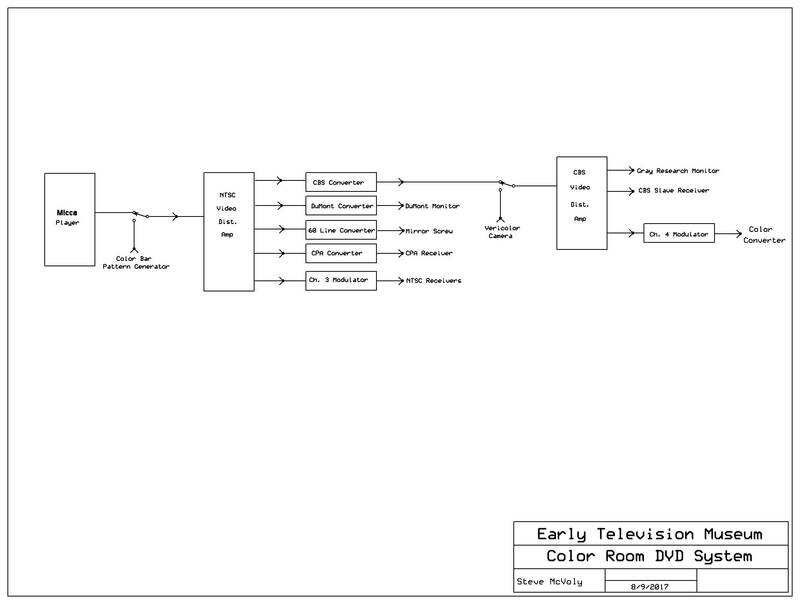 The video output of the Micca player for the Baird Televisor is also connected to the video switch so that home page of the Micca can be displayed in order to control its operation. We are also using a Micca player in the Color TV room, where we have a distribuiton system for both NTSC and 405 line color.